Employees are the heart of a company and their satisfaction is important. So why not ask? How to gain valuable employee feedback? Just simply create employee satisfaction surveys and ask them directly. Online Surveying is the preferred method now. 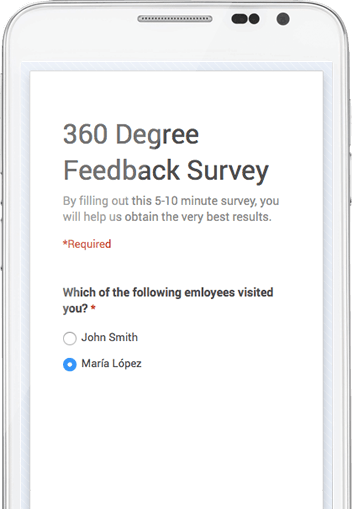 Employees fill-out an online survey instantly with a variety of respondent options. This method removes the expensive links in the chain, as data is processed automatically it also removes the likelihood that data can be manipulated. Why is it important to have satisfied staff? Employee productivity increases and they take less time off. Employees are more loayal to the company and become more involved, not just in their daily tasks, but in the way they view your company. They feel more engaged and responsible. Employees have a huge impact on the company‘s success. If they are unsatisfied, they can harm the company unintentionally or even worse on purpose. You can highlight many problems before they affect the customer, but timely prevention is the aim. How to create employee satisfaction surveys easily? It's really easy. Sign-in and create a survey using ready-made templates. This is not where your work ends: To truly survey your workforce you musn’t forget to process all the information you receive and draw conclusions from it. It is the last, but most important step in an employee satisfaction survey for every manager or company owner to consider when handling the results. Get started now, and have more time to evaluate the results!